It's not quite in a galaxy far, far away -- but the latest planet discovered by NASA is one of the most remote ones known to exist outside of the solar system. NASA's Spitzer Space Telescope worked with a telescope located in Chile to pinpoint the distant gas planet, which is located approximately 13,000 light years from Earth but still within the spiral-shaped Milky Way galaxy. 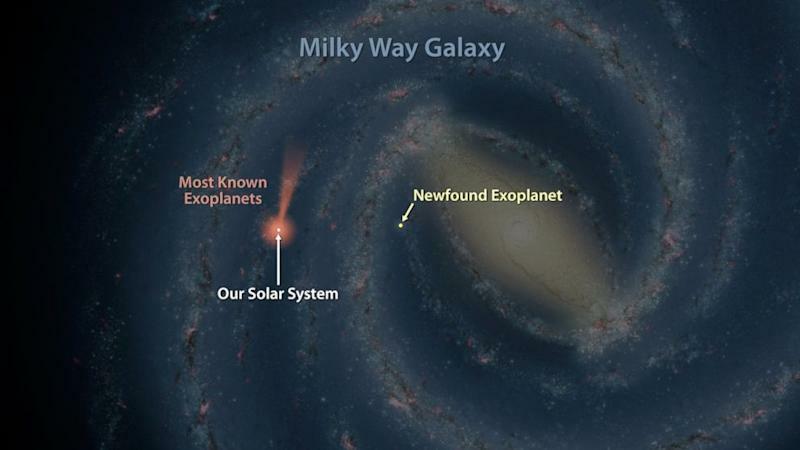 Most known exoplanets exist much closer to our solar system in the Milky Way, making this discovery, which is farther away, significant to astrophysicists. "We don't know if planets are more common in our galaxy's central bulge or the disk of the galaxy, which is why these observations are so important," Jennifer Yee, a NASA Sagan fellow, said in a statement. Spitzer is currently based 128-million miles from Earth, farther than the distance between our planet and the sun, and is on a path circling the giant star. The discovery was made thanks to microlensing, which is when one star passes in front of another. During this time, gravity acts as a lens, and intensifies the distant star's light. If a planet is in orbit, it may appear as a blip in the observation, NASA said. Spitzer can watch a microlensing event at the same time as the telescope in Chile and will see the star brighten at a different time due to the varied distances and views of both telescope, allowing NASA to better gauge distance. In the case of the newly discovered exoplanet, both telescopes saw the planetary blip 20 days apart from each other.